John Ronald Reuel Tolkien was an English writer, poet, philologist, and university professor, best known as the author of the classic high fantasy works The Hobbit, The Lord of the Rings and The Silmarillion. English writer J.R.R. Tolkien is a towering figure in fantasy literature. 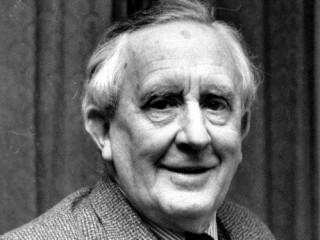 He wrote the novel The Hobbit (1937) and the classic trilogy The Lord of the Rings (published 1954-56): highly imaginative tales of elves, dwarves, and wizards in a land known as Middle Earth. The hobbits Bilbo and Frodo Baggins and the wizard Gandalf figured prominently in these stories and became Tolkien's best-known characters. Tolkien was an expert linguist and a longtime professor of language and literature at Oxford University. He was also part of C.S. Lewis's informal group of scholars and writers known as "The Inklings." The three books which make up The Lord of the Rings are The Fellowship of the Ring, The Two Towers and The Return of the King . A live-action film trilogy of The Lord of the Rings, directed by Peter Jackson, was a great box-office success; the first film in the trilogy, The Fellowship of the Ring, was released in December of 2001, followed by sequels in December of 2002 and 2003. Those films starred Elijah Wood as Frodo, Viggo Mortensen as Aragorn and Cate Blanchett as Galadriel... Tolkien's colleagues at Oxford included the famed poet and author Robert Graves... In 2006 one of Tolkien's sons, Christopher Tolkien, announced the completion of the 30-year editing process for the publication of his father's work The Children of Hurin.